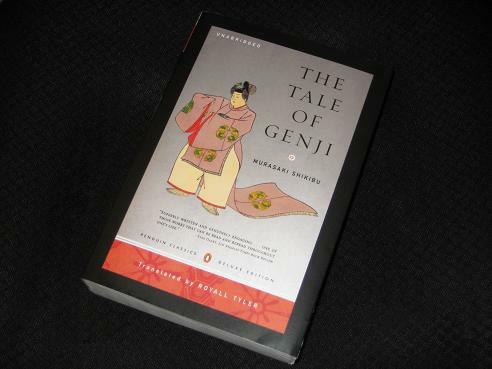 Yesterday, I started my review of The Tale of Genji, but it turned out be a little long for one post (great for an undergraduate essay, though!). Let’s continue today, then, with some more ramblings on Japan’s most famous literary work, focusing on some of the similarities and differences between today and the Heian period, and a celebration of the work of the translator – shall we? For the modern (Western) reader, part of the beauty of The Tale of Genji lies in its otherness. It was actually a historical novel in its own time, set mostly in the tenth century (and written towards the start of the eleventh) and was very much a tale of the upper echelons of society. The book abounds in detailed descriptions of ceremonies, music, wine and arranged marriages, with frequent presentations of gifts of robes and cloth to visitors and messengers whenever they arrive with love poems or summons to the court (the former being far more common than the latter…). It’s a work which is alien in many ways, mainly due to the vast gulf in both time and space separating the text from the modern Anglophone reader. With no medical knowledge to speak of, healers were reduced to performing prayers for the sick, with rich benefactors commissioning teams of monks to chant healing sutras. The women who inspired such lust in the testosterone-fuelled nobility rarely appeared in daylight, being mostly hidden behind blinds, shutters and curtains, meaning that the more adventurous of the men would take risks just for a glimpse of a comely silhouette outlined against a thin veil. Politics, then as much as now, was a very dangerous game to play, and Genji, while powerful, also has some fairly influential enemies at court. I really enjoyed this review, thank you, Tony. Even if we disagree about the translations! As you know, I’m a fan of the Seidensticker translation, perhaps because it was the first one I read (rather like one remains a fan of the first Doctor Who one sees). I prefer its clarity and adaptation to a more Western palate, rather than the very literal Tyler one (which would appeal more to scholars). I’d also like to put in a good word for the Waley translation for its sheer entertainment value. Inaccurate and coy in many places, cutting huge swathes of text out, it is nevertheless a curiosity piece which is worth taking a look at whenever you decide to re-immerse yourself in the world of Genji. I got about two-thirds of the way through volume one of this translation. I adored it, but haven’t started it up again. I do plan to one day. Maybe as a summer project in 2016. It’s one I should spend some time with, a slow read in a very positive sense. I read the same translation but never made it past page 110 (and then it ended up on my ‘life is too short’ shelf). Partly because of the translation, partly because Genji is a huge creep and I just didn’t have the patience for it any longer haha. Should I give it another try? Not you, personally, of course!